Editor’s note: A 10-year-old girl named Latanna Stone from Valrico, Florida, has qualified to play in the U.S. Women’s Amateur. Stone shot a career-best 70 in the qualifier and smashed the youngest competitor record by two years. Time to reintroduce you to this Arizona boy. WHEN ALEXIS THOMPSON RECENTLY TURNED PRO to play on the LPGA Tour at the age of 15, some questioned whether she was too young for the rigors of tour life and openly wondered about the potentially damaging attention she might receive. But Thompson is a grizzled veteran compared to a 3-year-old Arizona boy who may enter the PGA Tour’s Qualifying School this fall. The boy’s agent told ARMCHAIR GOLF in an email that his young client got an earlier start in golf than Tiger Woods and other golf prodigies. The boy began making arm movements in his mother’s womb that simulated a golf swing and has aspired to play on the PGA Tour since he was 1. That was when he watched Woods beat Rocco Mediate in a 19-hole playoff to win the U.S. Open. 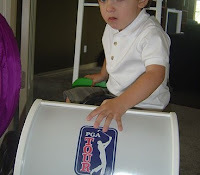 One large roadblock that stands in the boy’s way is the PGA Tour’s age rule. A player can enter Q-School at any age but isn’t allowed to become a PGA Tour member until his 18th birthday. Apparently, business opportunities are already available. Golf companies and mega brands are always on the lookout for the game’s new star players. For now, the boy’s parents and agent are guarding the boy’s identity should they decide to enroll him in preschool and forgo the Q-School bid until he’s 4. Luke Donald: Happier at World No. 2? The Shotmaking Genius of Christy O’Connor Sr.